If couple of posts back I sounded bitter with my anger towards photo theft then let me make it up with today’s post, a post full of sweetness and love sent in the form of carefully selected gifts from my blogger friends. I have always mentioned that if there are few bad people then there are plenty of good hearted human too and today I must talk about one of them. She is none other than my very dear friend Anjali Koli of Annaparabramha. Though I have never met Anjali in person but she holds a special place in my heart. I don’t know how I sound on my page but basically am a very shy and private person. and don’t know why but am never comfortable or confident around people I have never met personally. But with Anjali and some others in the blog world the thing is very different. When Anjali and I started interacting both of us were in Bangalore yet we could not meet and then I shifted to Kolkata and she to her native place Mumbai. 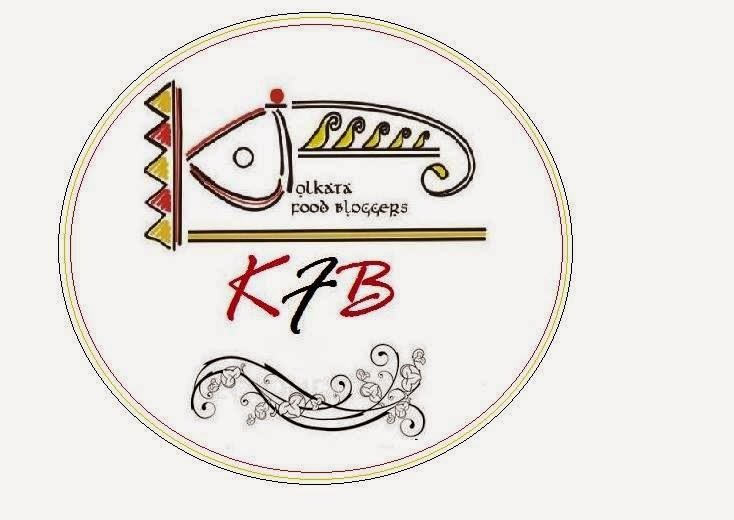 Her blog chronicles a beautiful journey where she writes about the food she cooks, the pets she cares about, the crafts she makes, the tradition and culture of her Koli community and about a beautiful place called Thal, A serene village in Raigad district of Maharashtra. 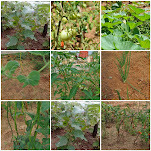 If you ever have read a single post from her blog you will agree with me that her write ups are a joy to read. 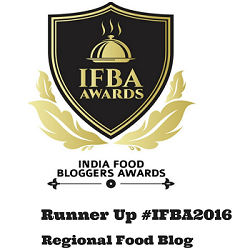 Her recipes are simple and her style of writing is very close to heart, bears the rustic aroma of traditional Marathi and Koli cuisine. Recently she has started helping some self help women groups in Mumbai and this year her Diwali faral hamper was a roaring success. If you are in Mumbai do not give these traditional sweets and snacks a miss (During Diwali). It’s a great thing even to bring smile to your families living in India. Her newest project is authentic spice mixes and the fist mix in offer is this Koli masala. I am lucky to have received few samples of it. Not to mention along with many other gifts for me. This Koli spice is extremely flavourful and could be used for both veg and non-veg dishes. 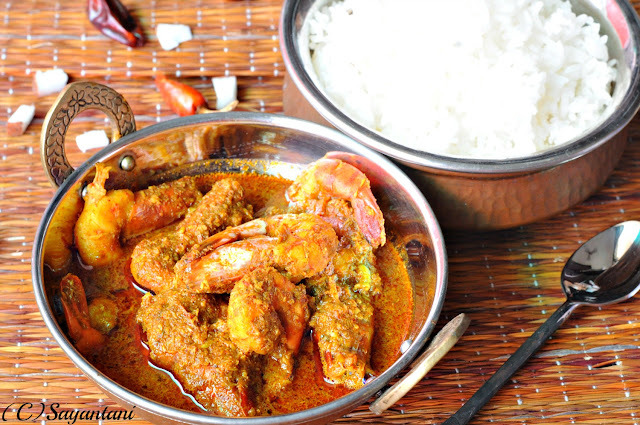 I discussed with Anjali and decided to go for this lobster dish called PochachaKanji from her blog. I tried to follow her recipe as much as possible but had to replace a few things. The outcome is simply stunning. It was quite spicy yet my always spice hating son kept on eating and chanting, “I have grown up and mumma now I can eat spicy food “. Same with the husband, he loved it and inquired about the next time am planning to prepare this. My next try would be her mushroom dish with this same spice mix. Clean and wash the prawns. Mix in little salt and turmeric and keep aside. In a grinder make a thick paste of the red chilies, coconut and koli masala and coriander. Mix this with the prawns, also add a spoonful of oil to it. keep aside for 15 minutes. Mix the garlic paste with 2 tbsps water. Heat 1 tbsp oil and add the garlic paste. Sauté till oil starts to separate at the sides and the raw smell of the garlic is gone. Add the prawn mixture and cook on medium flame for 2 minutes. Keep stirring so that the spice is cooked through. Add ¾ cup of water and tamarind paste. Mix and cook on medium for another 2-3 minutes. 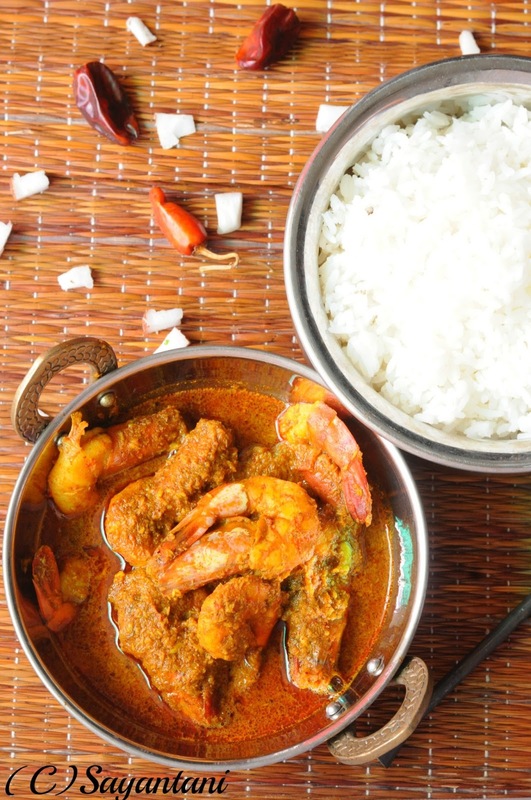 Prawn recipe, Prawn recipes, Prawn curry, Prawn, Bengali prawn, coastal prawn recipe, curry prawn recipe, spicy prawn curry recipe, Koli lobster curry, koli prawn curry, koli masala, koli spice mix, where to get koli spice, koli masala online order, koli seafood curry, coconut prawn, Maharashtrian prawn recipes. 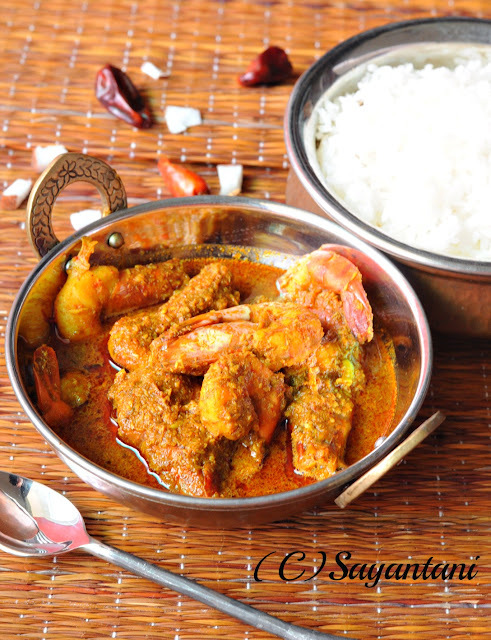 Sayantani I am glad you and family like the Masala and the recipe. By the color and the oil on top you score a 10/10! If you ever serve it to a koli they will pat your back. Touchwood! May our friendship grow and we will meet one day. Yes even now I remember how we missed meeting at Kormangala Durga pujo. You shower so much love on us friends and you deserve more. Wow..great to know about Anjali's venture. 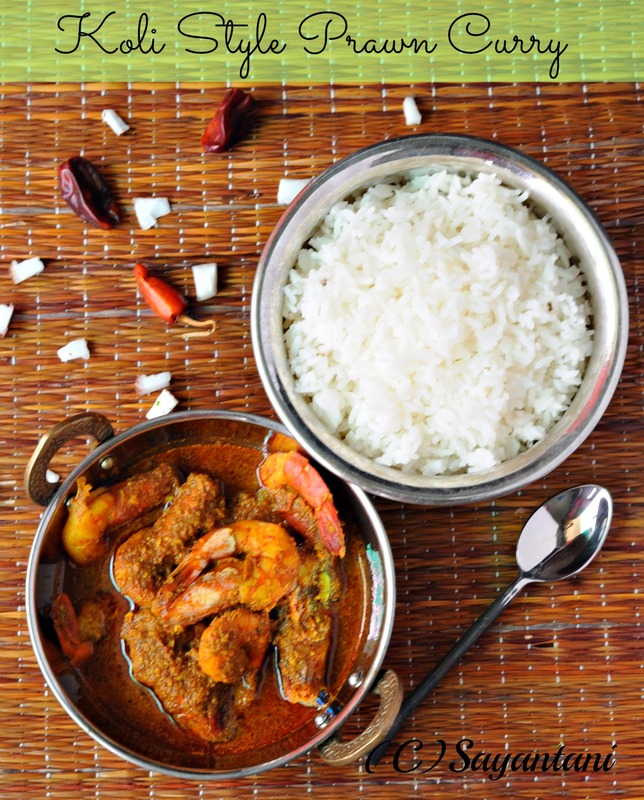 I love prawn curries, and this looks yum. The dish looks so so great Sayantani ... ekkhuni bhaat diye mekhe khete icche korche. thanks for introducing this new dish ! looks great ! Koli food is really exciting and has some amazing seafood, given that they are the original residents, the fisherfolk of Bombay, when it used to be several small islands. Thanks for sharing this recipe. Looks amazing and am sure will taste as well. Am bookmarking it for a cold rainy day!